I talked before about waiting for a shot that I don’t think ever materialized the way that I wanted it, but when I left I stumbled upon a shot that made me happy about the effort. I also took this one while waiting for the sun to set and looking for a place to sit. The boys begged me to snap a pic of the dead bird directly in front of me, but (haha) no! I was inspired to take this by another pic that I had seen while cruising the Flickr map. The photographer had snapped her pic while the water was glass smooth and had gotten great reflection of one bridge and the sky. I was moved when sitting underneath by the movement of cars shooting overhead and, as one person commented on my Flickr photostream, the symmetry of the two sides. 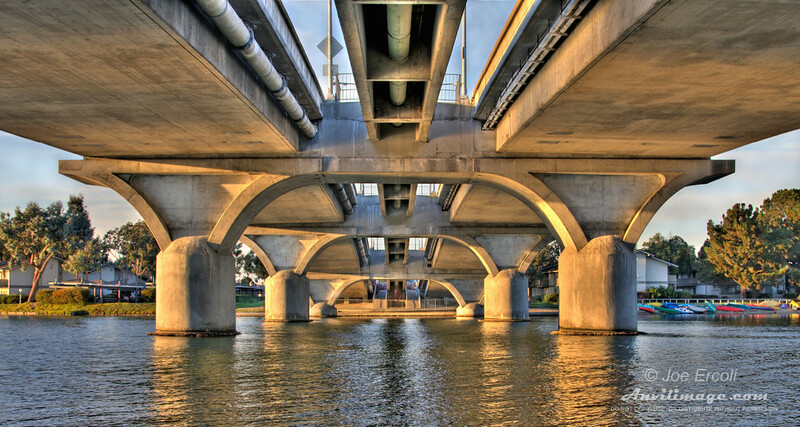 This entry was posted on Sunday, November 30th, 2008 at 11:37 pm	and is filed under Blog, Photos and tagged with bridge, bridges, foster city, golden hour, HDR, leading lines, reflections, sunset, water. You can follow any responses to this entry through the RSS 2.0 feed.